US manufacturing activity expanded at a faster-than-expected rate in February. The Institute for Supply Management's (ISM) manufacturing index rose to 53.2 from 51.3 in January. A reading above 50 indicates expansion. Separate data showed construction spending rose slightly in January, helped by residential construction. Manufacturing and construction are key to the US economy and there were fears that severe weather across many parts of the US may have hurt the sectors. Bradley Holcomb, chair of ISM's survey committee said that while several manufacturers said severe weather was impacting their business, "other comments reflect optimism in terms of demand and growth in the near term". Meanwhile, data released by the US Department of Commerce, showed that construction spending rose 0.1% in January, from December. Compared to the same month last year, construction spending was up 9.3%. However, the bad weather conditions impacted car sales in February with General Motors, Toyota and Ford all posting declines in their deliveries. 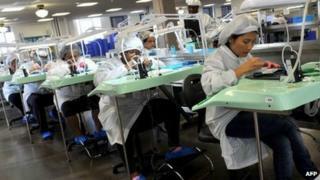 But the drop in sales was was less than expected and manufacturers were upbeat about the prospects in the coming months. "February auto sales emerged from a chill in the second half of the month, positioning the industry for a strong March," said Bill Fay, general manager at Toyota, which saw a fall in deliveries of 4% during the month. General Motors' sales fell 1%, compared to analysts' forecast of a 6% drop. Chrysler and Nissan Motors beat the trend with sales increases of 11% and 16% respectively. Analysts said that overall car sales during the month had been helped by incentives and discounts offered by dealers to lure customers to showrooms in an attempt to cushion the impact of the severe weather conditions. "Incentive spending is outpacing the rise in average transaction prices," said Larry Dominique, executive vice president of TrueCar. According to TrueCar, the average incentive being offered to customers rose to $2,633 (£1,580) per vehicle in February, up 5% from a year earlier. However, he added that as weather conditions improve, the discounts will reduce. "We expect a return to balance once the winter subsides and inventories ease."